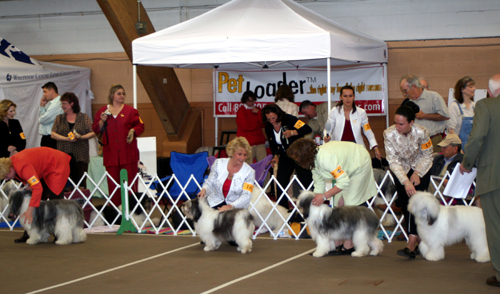 After the judge stops the line, he will individually examine each dog. "Stack" your PON and step back as the judge approaches him. Do not drop the leash. Answer all of the judge's questions, such as if the PON "bites," his age, etc. He may ask you to show him the PON'S teeth. Listen carefully. Do not volunteer additional information. When the judge has checked your PON'S physical structure completely, he will want you to gait your PON. Please listen as he tells you where to go, and if you do not understand, ask him again. Watch those who are sent out before you. Judges vary on how to efficiently view gait. Know the different patterns, and practice them in handling class. When you return to the judge, he may send you out again, instructing you to go faster or slower, or in a different pattern. He may be looking for something special in the PON gait. Most judges will stop you as you bring your PON back from the gaiting with a wave of their hand. Stop quickly and alert your PON. The judge is trying to determine the PON'S "expression." This is an important moment for most judges. When the judge is through with your PON, and beckons to the next one, go to the end of the line, "stack" your dog, and try to keep him looking his very best as the judge goes over the other PONS. Most judges will look back from time to time, mentally comparing the PONS. Don't allow an early impression to be lost by allowing your PON to become distracted or act up at this time. After going over all the PONS in the class, the judge will probably send all the dogs together around in a final circle, and then make his selections. If you are in the first four placings, go to the placing so indicated and take your ribbon, thank the judge and leave the ring. First and second place winners stand by for possible further judging. Remember that the well-trained PON has the advantage in that he shows the judge his very best points, rather than making the judge come and look for them.